After Great Britain’s tragicomic exit from the EU, the empty space has to be filled quickly, otherwise the EU might collapse. Europe has turned its eyes on Kosovo, which unexpectedly finds itself facing an historic opportunity, which it must exploit. But, as always, it comes with a huge challenge. In addition to Kosovo, Serbia also has the chance to enter the EU. People and animals in Kosovo mobilise to meet the standards that Europe has set as a condition of entry, and to do this better and faster than Serbia. The basic EU document that is given to the Kosovar authorities is called Kosovo and 3,000 easy regulations on the way to Europe. The Tony Blair Slaughterhouse in Prishtina, from now onward, must start to sell meat which has been quality-controlled. In their effort to meet this condition, the owners of the slaughterhouse make a Kafkian journey through the state bureaucracy, dealing with officials and bureaucrats who are unhelpful and corrupt. They even have to steal a giraffe from the Skopje zoo for the prime minister of Kosovo to eat on his birthday. And while some people in the new country naively commit to this new challenge, the Orwellian world of animals mobilises and wants to exploit this political momentum to set out and articulate their demands for more dignified slaughter. Written by a local cynic, this play is a tragicomic panorama of the current Kosovar and European reality. Kosovo’s sincere aspiration to join the EU is confronted on the one hand by confusing and ridiculous European regulations and requirements, and on the other hand, by the ruses of bureaucrats who care only about making things ‘look okay on paper‘. Since its foundation in 2002, Qendra has produced and coproduced several theater performances, among which; “One flew Over the Kosovo Theater”, “Yue Madeleine Yue”, “Patriotic Hypermarket”, “The Last Supper”, “War in Times of Love”, “Love. State. Kosovo” “The Demolition of the Eiffel Tower”, “Peer Gynt from Kosovo” etc. Qendra creates fresh and innovative theater performances that communicate across lingual and cultural borders and brings these performances to diverse audiences locally and internationally. 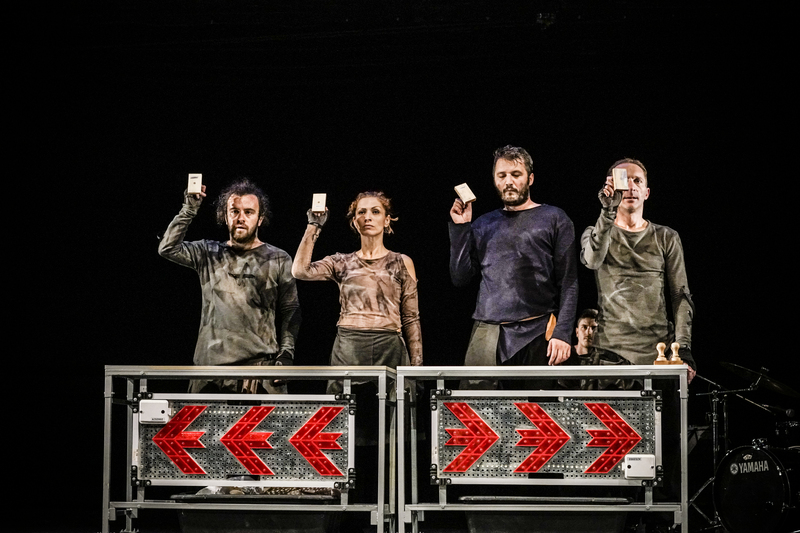 Qendra is one of the most prominent independent theater companies from the Balkan, producing mostly the so-called ‘political theater’. Qendra’s productions have been shown in around 20 countries, as well as have been presented in various festivals throughout Europe, including: Euro-scene Leipzig; Die Besten aus dem Osten, Vienna; Via Modena – Italy; FIT Lugano; Spielart Festival München, Zürcher Theater Spektakel – Switzerland, Desire Festival Novi Sad – Serbia, Exponto International Theatre Festival – Lubljana, International festival Theatre European Regions – Hradec Králové, Festival Printemps d’Edurope, Lyon, Demoludy – Olsztyn, Poland, ect. Blerta Neziraj, born in Prshtina, has been directing plays at Qendra Multimedia and Dodona theater in Kosovo. Her last four plays she directed, “Yue Madeleine Yue” (Volkstheater, Vienna, February 2012), “One Flew over the Kosovo Theater” (National Theater of Kosovo, Prishtina, December 2012), “The Demolition of the Eiffel Tower” (National Theater of Kosovo, December 2013), “War in times of Love” (National Theater of Kosovo, May 2015), have been touring to many theaters and festivals, locally and Internationally, including: International Festival of the Contemprary Theater euro-scene Leipzig, zoom Festival Rijeka, VIE Festival Modena, National Theater of Albania, National Theater of Kosovo, Volkstheater Vienna, Gjilan City Theater, Théâtre Nouvelle Génération – Lyon, Divaldo Evropskÿch Regionû – Hradec Kralove, Babel Festival – Rumania, Intercity Festival Firenze, Schlachthaus Theater Bern, ect. She studied Psychology at the Université Lumière Lyon 2, Theater Directing in Faculty of Arts in Prishtina and did an MA at the University of Dramatic Arts in Skopje. Currently she is working as a theater lecturer at the American University in Kosovo. With her performance, The Demolition of the Eiffel Tower, in January 2014, in the festival, Flaka e Janarit, she won the prize Best Directing. Jeton Neziraj was the Artistic Director of the National Theatre of Kosovo and now he is the Director of Qendra Multimedia (www.qendra.org), an independent theater company focused on contemporary drama and theater. With his play “Lisa is sleeping” he won the first prize at “Buzuku” competition for the best Albanian Play in 2006. 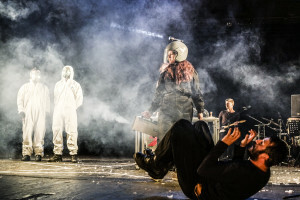 His play “One Flew Over the Kosovo Theater” won the Special Award at the 8th edition of the JoakimInterFest (2013), with the Jury motivation: “brave and non compromise play”. Neziraj is the author of many articles on cultural and political issues, published in local and international magazines and journals. As a playwright, he has worked with theatres and companies such as: Volkstheater Vienna, National Theater of Wales, National Theater of Montenegro, Turkish National Theater – Istanbul, Schlachthaus Theater Bern, National Theatre of Kosovo, Hessisches Staatstheater Wiesbaden, International Theatre Festival MESS Sarajevo, Bitef Theater Belgrade, Gerald W Lynch Theater – New York, Nomad Theater – London, Collectife Termos – Paris, etc.